THERE ARE sleek super yachts moored next to wooden fishing boats in Hvar harbour and serious gold glinting off the necks of the women sitting in the waterside cafes. In recent years Croatia has been dubbed the 'new' quite a lot. The Dalmatian Coast is the 'new' Riviera and Hvar is definitely the 'new' St Tropez. The yachting set, celebrities (think Beyoncé and Jay-Z) and your average jet-setting hedonists come to play here all summer long. I can see the attraction. I've arrived by water myself - 'the only way to arrive darling' - on the sleek and luxurious Le Soleal (Companie du Ponant). A boutique cruise ship so understated and stylish it was born to sail this newly cool coastline. We've sailed past a string of misty blue islands in the Adriatic Sea, each one looking more perfect than the last but Hvar is definitely something special. Its siren song seems to attract flotillas of yachts flitting like dragonflies over the water towards its pretty harbour. As our tender heads to shore the water is an iridescent blue and the buildings blush pink in the morning light. Apparently this perfect day (#no filter) is the rule, not the exception as another attraction of Hvar is that it is officially the sunniest place in Europe; with 300 days of sunshine a year. Which explains the toffee-coloured tans of the Bright Young Things that stroll Hvar's cobbled streets; Brigitte Bardot re-imagined with highlighted honey manes and strappy, jewelled sandals. The streets of the old town are lined with old stone buildings housing modern boutiques full of coral jewellery, gold tummy studs and nautically striped T-shirts (know your market...). Walking back down the steep streets from the castle on the hill I pass bars and restaurants with bright cushions laid out on the steep steps, next to traditional shuttered homes. 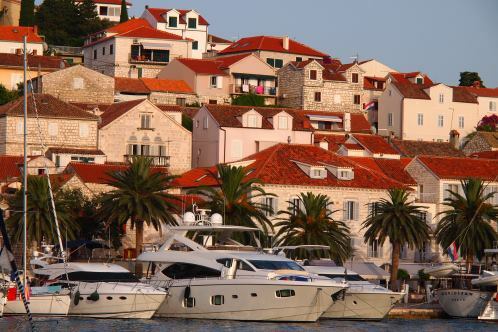 Away from the town centre it is surprisingly easy to access the more traditional side of Hvar. I escape the heat in the cloistered quiet of the Franciscan monastery and in a wood panelled refectory I am completely alone to contemplate the monastery's main claim to fame - a 17th century painting of the Last Supper. Further up the hill a local grave yard is where generations of Ivans and Radics have been buried. Bright plastic flowers adorn every headstone (the real thing is obviously de rigeur). An old mansion houses the local library with sloping wooden floors and rickety shelves , where local children come to study. In the island's interior are silvery-purple lavender fields and wild asparagus. Along its coastline fringed with pine trees are secluded beaches. A speed boat- rented by the side of the town beach - will also take you to an archipelago of tiny deserted islets. The designer-bikini set head to the lavish private luxury of the Bonj Les Bains Beach Club Originally built in 1927, the country's most exclusive beach club is built into a hillside with a large terrace overlooking the sea and private over-water pontoons equipped with chaises and daybeds draped with diaphanous white curtains. Attendants flit between pontoons offering fresh fruit, cocktails and other delicacies to tempt the blissfully bronzing occupants. On the upper level, there are cabanas for open-air spa treatments this is celebrity central and Kevin Spacey once hired the whole club. According to Barchick.com -who know about these things and who are we to argue - the top spots for accessing the in-crowd party scene are: Carpe Diem full of rich-kids (Prince Harry at one point) seizing the day and the night. Hula Hula, the perfect sunset-on- the-rocks viewing bar. Then there's rustic Ka'Lavanda and sophisticated Zori on neighbouring Palmizana and reached by boat (have yacht, will party). We choose Ka'Lavanda down a narrow alley opposite the cathedral. Al fresco at its best. Although Bar Teraza with a bird's eye view of the square looks good too. The Adriana Marina Hotel & Spa has a spectacular rooftop bar overlooking the old town, a vast Sensori spa and a blue mosaic tiled pool. Riva Yacht Harbour Hotel occupies an old stone building on the seafront in contrast inside is cool minimalist décor. Those looking for private luxury should book into Villa Theia a 1612 Baroque house in the heart of the old town once owned by the Marchi family, one of the oldest Italian families in Hvar which sleeps twelve in serious style. The slow-food restaurant Zlatna Skoljka set in the garden of a 14th-century palazzo is one of Hvar's top gourmet hangouts. The nearby Gaxia with its sculptured metal fish lights and walled courtyard is also worth a look. Lucullus is well-named after a Roman general who was well-known for staging lavish banquets in the 1st-century BC.